Does the Keynesian multiplier depend on the (marginal) yield for government debt? El motivo fundamental de estos bajos multiplicadores es la necesidad de reequilibrar el presupuesto público con incrementos futuros de impuestos que reducirán el consumo y la inversión. Dado el mayor coste de financiar la deuda española frente a la de Estados Unidos, es razonable pensar que el multiplicador del gasto en infraestructuras sea también más pequeño en España, que tendría que subir sus impuestos futuros más que EE UU si quisiera aumentar su déficit corriente. Hmmm… This is a rather fuzzy picture of the Keynesian multiplier. First, there is the argument that an increase in public spending today reduces consumption and investment now and in the future. Then, the Keynesian multiplier is assumed to depend on the (marginal) yield on government debt. The first argument is clearly wrong. Investment in Spain is weak, as is consumption – the 0.2% of growth in 2010Q2 has been the best on record since early 2008. Unemployment hovers around 20%, which means there are lots of idle workers. 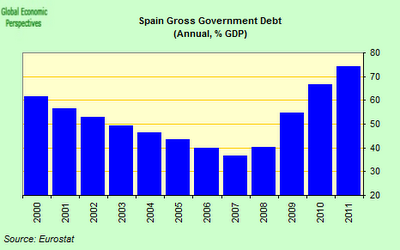 Crowding out the private sector with government spending in Spain? Very, very unlikely. The second argument, I must admit, is new to me: “given that the costs of refinancing are higher for the Spanish than for the US government, it is reasonable to think that the multiplier for government spending in Spain would also (sic!) be smaller, given that more taxes would be needed in the future to repay the debt”. A question springs to mind. With youth unemployment at around 40% (.xls@OECD), how will it be possible to repay Spain’s government debt ever? Probably it won’t, and probably there is a problem in consistency. Let me first point out one thing: there is no empirical work proving a link between the yield of government debt and the size of the multiplier that I am aware of. That does not mean that the connection does not exist, though. However, the case is less than straightforward. First of all, the multiplier is not about government investment in efficient infrastructure. While it’s not bad to have that, the effects after the first round matter at least as much. Let me elaborate. Additional GDP (Y+) is equal to the increase in government spending (G+) divided by one minus the marginal propensity to consume, which I have put at 0.2. Given the balance sheet problems of Spanish households and financial institutions that might be too optimistic. I would love to see a discussion of this point, but let’s leave that for the future. So, an increase in fiscal spending by €10 billion creates jobs in the private sector for that amount if the government doesn’t build everything itself (which it won’t), plus an additional €10 billion of demand coming directly from workers without government interference. On top of that, savers can put €10 billion into government bonds to collect a low but positive yield. This works as long as the Spanish economy comes out of the slump with the help of the additional government spending and is able to generate enough incomes to stabilize the government debt at sustainable levels. If this is understood, then we can talk about different interest rates and their influence on the multiplier. The higher the interest rate is, the more money will be redistributed to bond holders in the future. How does this affect spending, and therefore the multiplier today? Tricky question. Will tax payers spend less today if they face increased future liabilities, and will bondholders spend more? From what I can say, the answers are “probably not”(see the CBO’s evaluation of the 2009 stimulus) and “don’t know”. Does this depend on the interest rate that bond holders earn? Maybe yes, but other factors are more important. Spain went into the crisis, which was caused a debt-led real estate bubble, from a relatively low level of government debt in 2007 (below 40%), and the nominal interest it pays on its bond is lower now than 8-10 years ago, when government debt was higher. What is more, the rate is falling right now. The Spanish economy is around a tenth of the US economy, so a fiscal stimulus of $50 billion dollars in the US would find an equivalent in a €3.8 billion stimulus in Spain. Which, by all means, is a real economic policy option. If you choose to ignore it, that is politics.